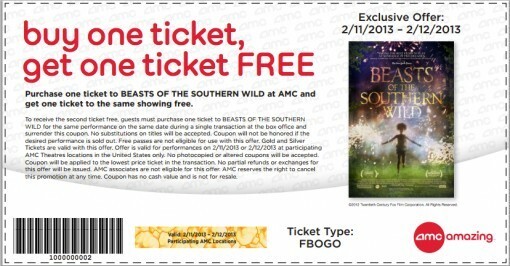 In celebration of this year's Oscars 2013 Best Picture nominees, AMC Theaters is offering 'Buy One Get One Free' tickets to Beasts of the Southern Wildat select theaters this Monday, February 11 and Tuesday, February 12. All you need to do is print the coupon and purchase your tickets at the closest participating theater near you. 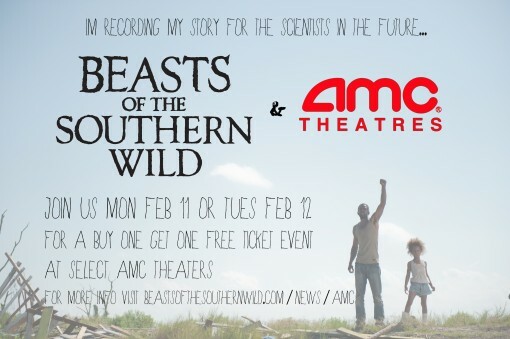 If you don't see your local AMC in the list below, give them a call and tell them you want to BOGO Beasts of the Southern Wild! If you plan to attend, RSVP by the links below and enter a chance to win Beasts merch like our award winning Soundtrack LP, DVDs, signed posters, buttons and more!